Doctor Apel relates his personal experiences during the Korean War... not exactly the same as the TV show (although he did provide input for that program). Dr. Apel arrived in Korea as a newly-minted doctor who was basically called up based upon his participation in a WWII doctor training program for the Navy. Given a commission and an Army uniform he was not properly prepared for duty at a MASH, which saved lives by getting the wounded surgical care as quickly as possible. 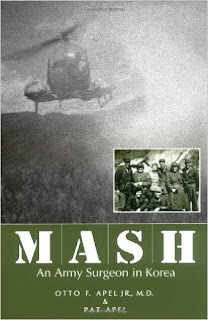 Apel talks about the work conditions, the use of early helicopters for supply and evac, some of the characters he met while in the Arrny, even the bureaucratic red tape which threatened to stop doctors from saving limbs. All this during the Korean War, a hard-fought conflict which should really be remembered today.